The Women’s Reproductive Health Research (WRHR) Career Development Program (K12) at the University of California, San Francisco (UCSF) is sponsored by the Department of Obstetrics, Gynecology and Reproductive Science. The WRHR program provides advanced basic and clinical research training and career development in women’s reproductive health research for obstetrician-gynecologists. The program accommodates trainees with varying levels of research experience and derives from a broad-based initiative with research, mentoring, and trainee evaluation as cornerstones of the program. The goal of the WRHR Program is to train junior faculty to be successful, independent clinical, translational, and basic science investigators in women's reproductive health. The overall objective of the WRHR Program is to bridge clinical training with basic, translational and/or clinical research independence through a mentored research experience leading to an independent scientific career addressing women's reproductive health. 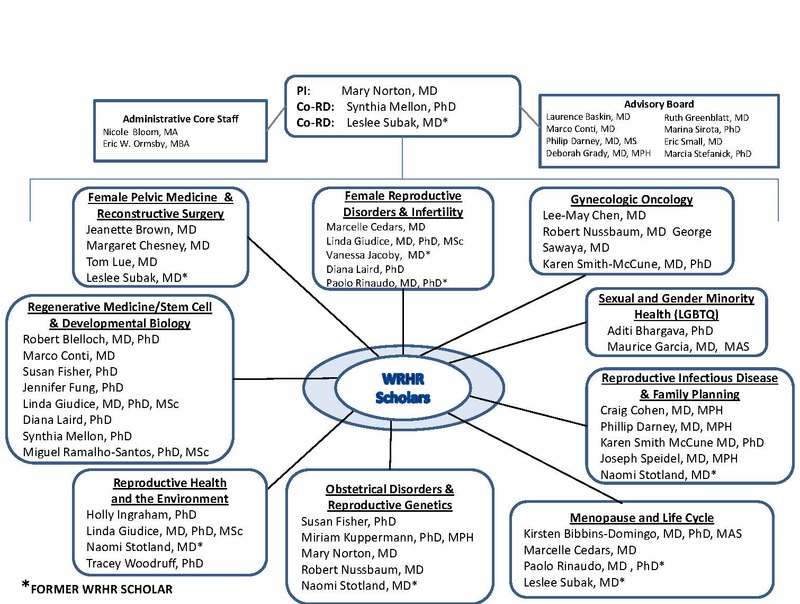 The WRHR program builds on the training and research successes of UCSF, the institution’s commitment to women’s health, and the availability of extensive supporting resources to develop a training environment for scholars who will have sustained contribution to the field of women's reproductive health. This partnership affords a unique opportunity to offer a training program that can meet the long-term goal of increasing both the amount and quality of multidisciplinary translational research conducted on women’s health and the number of individuals with successful independent research careers in women's health. UCSF has a rich research environment with an extensive array of ongoing research projects in women’s reproductive health. Nationally and internationally renowned women’s health scholars can be identified in almost every school, department, and research unit. Because of this broad-based campus agenda for women’s health, UCSF was designated one of the original six National Centers of Excellence in Women’s Health by the Department of Health and Human Services Public Health Service Office on Women’s Health. Scholar positions are being offered by the UCSF Department of Obstetrics, Gynecology and Reproductive Sciences for two to five years of intensive research training. The department offers a mentored, structured scholarship program of sufficient duration, adequate relevant course work, immersion into a vibrant, intellectually challenging, academic research community and “hands-on” research experience to give scholars the ability to be productive, independent and funded junior faculty members, and ultimately lead to rewarding, successful and productive academic careers.